It was unveiled on Saturday for attendees at Osaka's in-store preorder event, and now the video is available for everyone else to see. 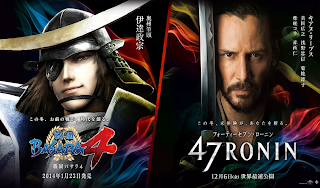 Twitter erupted on Friday last week when it was revealed that the next major Sengoku Basara 4 tie-in was a promotional campaign with the upcoming Keanu Reeves movie 47 Ronin. It's a rather unexpected collaboration - not least because the chuushingura film has nothing to do with the game! A special website has been set up for the campaign and the official 47 Ronin Facebook and Twitter accounts will be posting movie 'reactions' from the Sengoku Basara 4 characters. The promotional materials are careful to emphasise that Date Masamune won't be appearing in the movie (sadly) but fans can still enjoy the references. Date Masamune: One-eyed Dragon King, Date Masamune...together with the 47 Ronin, I'm pressing on to eradicate Kira! Let's Party!! Ya-ha!! Katakura Kojuurou: The 47 Ronin, a tale of loyalty. Ugh, I can't help it...it moved me to tears. Ishida Mitsunari: Look! The Ronin! Eternal! Reincarnation! Sanada Yukimura: The pure love between Kai-dono and Mika-dono...! T-this... isn't shameless at all! The second activity is a contest. After liking the movie's Japanese Facebook page or following its Twitter account, post or tweet 'enthusiastically' about the 47 Ronin movie using the #RONIN_BASARA hashtag. Ten people will win a copy of Sengoku Basara 4 for PS3, while one person will get a 47 Ronin poster signed by the film's cast instead. The deadline is 23rd January 2014. Please note that you'll probably need a Japanese forwarding address to accept the prize if you win. I have to admit, however silly it is I'm getting a kick out of reading the quotes from the characters. Until now we'd only been shown computer-generated designs for this set of trading figures due out in late January; now there are some painted prototypes to give fans a better idea of how the finished versions should look. The secret character is still unknown. I'm convinced that it will be Keiji. 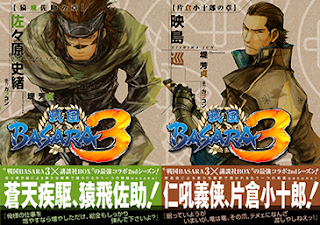 The next Sengoku Basara 3 x Kodansha BOX novel is still being released in December as planned. In addition, it now seems as though it will be joined by the final book in the series as both have been given a release date of 18th December 2013. The cover illustrations are both by Tsutsumi Yoshisada. Sasahara Shio is credited as the author for Sengoku Basara 3: Sarutobi Sasuke No Shou ('Sarutobi Sasuke Chapter') while Eishima Jun is behind Sengoku Basara 3: Katakura Kojuurou No Shou ('Katakura Kojuurou Chapter'). The website is currently down for its big launch later today. Although this will only be of interest to fan club members, it could well mean that we'll have another source of gossip about the new game to keep an eye on. The Yahoo! Japan Nengajou website has now released its range of ten Sengoku Basara 4 New Year's cards as promised, so fans in Japan can surprise one another (or themselves...) with a special message at the start of 2014. The next Sengoku Basara 4 news is likely to begin trickling in over the next few days via Weekly Famitsu magazine. I'm personally guessing that we'll see a formal announcement for Motonari to accompany his Sengoku Basara Magazine vol. 3 profile, as well as Sourin and Muneshige now that the magazine has dropped so many hints about the Xavists. Then, on Sunday, the last of the five in-store preorder events will reveal yet another new video. This will be the final opportunity for many fans to ask series producer KobaP questions in person for a while (unless they were among the lucky few selected for the Sengoku Basara 4 x Play.Community premium trial session ~Shinagawa Daigassen~ event one week later). The preorder event will take place on Sunday 8th December 2013 at Tsutaya's Sangenjaya store in Setagaya, Tokyo, and this time there will be two separate presentations by KobaP to accommodate twice as many questions from fans. The special preorder poster will be of Shima Sakon since his DLC outfit is the preorder bonus for the Tsutaya chain. On a personal note, I've been made aware that there are a few sites which re-post my blog entries as though they're their own, which is a little, er, weird. I don't mind the information being spread about freely or quoted/translated at all, but if you decide to re-post entire blog entries without making any changes would it be possible to preface them with an introduction stating that you copied them (and perhaps put a direct link to the original post which will have the latest version with any updates) so that people don't think that I write for your website too? Otherwise, people get confused and ask me why I've posted outdated/contradictory information on other people's sites. I'd prefer not to have my identity mixed up with that of someone else. Thank you! How annoying that there are people who simply copy posts without credit. I hope they wise up. LOL Maria! She is so sexual. She needs to be made playable as soon as possible so everyone can get the chance to roll up Masamune (or warrior of choice) in cloth and blow kisses at them. Ashigawa looks magnificent, obviously the super boss of this game with his roulette floor and everything. I'm hyped for these two and they're only bosses! Maria looks as though she will cause a lot of trouble for everyone. I can't wait to see it.